Editor’s Note: On Saturday, May 10 at 1 p.m., the state’s DCR and the Dorchester Historical Society will team up to present a special “Sweet History Stroll” to explore the former Baker Chocolate Factory site and learn about the sweet history of Lower Mills for those ages 10 and up. Meet at the public parking lot in Milton Lower Mills, beside the Milton Yacht Club at 36 Wharf St. 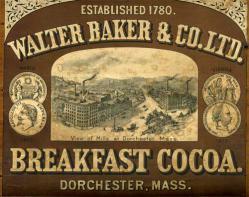 In 2002, the Reporter published this brief history of the Walter Baker Chocolate Factory by Peter F. Stevens. Something was in the air. People on their daily rounds along the roads of Dorchester and Milton Village turned toward the Neponset River and inhaled the spring breeze and took a deep whiff. Chocolate was in the air- literally. The year was 1765. The heavenly scent drifted from a sawmill on the banks of the river, within eyeshot of Boston. Inside the mill an Irishman watched two giant millstones grinding fragrant cocoa and sounding a call to a culinary revolution that was to spread from Dorchester and conquer the collective palate of America. Most significantly for Baker, the Irishman not only knew how to make the “sweet stuff,” but also how to set up and run a chocolate mill. Several New Englanders had tried to set up chocolate-grinding operations, but none had taken off. The closest that any entrepreneurs had come was in Providence, Rhode Island, in 1752, when Obadiah Brown had built a water-powered mill and had churned out four hundred pounds of the treat for Newport merchants. But he was not in the business for the long haul, just for a quick and lucrative profit. Baker, once he had determined that the Irish immigrant knew the chocolatier’s trade, staked both savings and energy on the venture, which he hoped would prove long-term. In the spring of 1765, Hannon was ready to put the plan to the test by grinding cocoa beans between two massive circular millstones. Now, his Dorchester partner would learn whether the Irishman knew his craft or had sold him a proverbial bill of goods..
No one knows exactly how and where Hannon had honed his expertise with chocolate. His past was - and is - elusive. But the enigmatic Irishman and the Dorchester doctor were poised to “cure” “chocolate-lovers’ elbow” - the soreness that colonists endured from grinding their own cocoa beans with their own pestles or hand mills.